Ataraxia’s vineyards lie at 450 metres above sea level, and close to the cooling influence of the ocean. 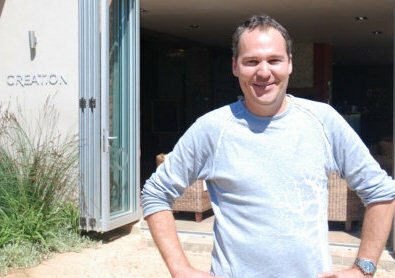 “It was 25c yesterday in Cape Town,” says winemaker Kevin Grant (below), “but only 22c at out farm.” That relatively small but crucial difference is one secret to Ataraxia’s very refined wines, but so are the variety of soil types, which allow him to make wines he describes as being “the expression of ancient soils”. Grant says he spends an enormous amount of time sourcing fruit from specific vineyards – vineyards that are special because of altitude, Ataraxia’s own vineyards are composed of Chardonnay and Pinot Noir, as these are the grapes that suit their soils. Sauvignon Blanc is sourced from contract farmers. 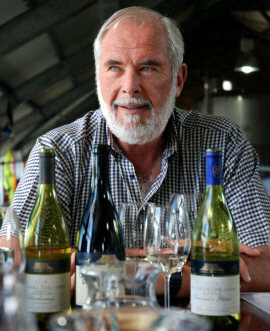 “We are a beer drinking, relatively unsophisticated market,” says Grant, which he says explains the appeal of Sauvignon Blanc: “it appeals because it is fresh, crisp and undemanding. “Unfortunately to meet that demand a lot of Sauvignon has been planted where it does not belong.” That, he says, forces winemakers to harvest early in hot climates to retain freshness, and the wines do not last. “The motto is ‘drink young’,” he says, “but we don’t necessarily believe that: our 2007 is drinking beautifully now.” Indeed, the Ataraxia Sauvignon Blanc seemns mineral driven, which Grant says is all down to the soils and climates from which he has sourced the grapes. “You can drink a bottle, not just a glass,” he says. Warming to his theme, Grant moves on to Chardonnay. “Its future in this country has got to be focused on cooler styles, not the big nickerbocker glory fruit salad. We need to understand the personalities of our vineyards, ferment them separately and really understand what they give us. There’s no point putting a vineyard that gives a very delicate, floral Chardonnay and sticking it in high toast oak.” For his ‘Serentity’ blend, Grant refuses to name the four varieties in the mix. When people try to guess what varieties are in the blend he counters, “hold on, you are not tasting four wines, you are tasting one”. He thinks this need to identify the components is partly about confidence: “I’d like people to just taste the wine and make their mind up if they like it without being prompted by assuming whether they like or dislike the grapes.” What he does confirm is that the varieties change vintage by vintage – there were three varieties last year, seven varieties the year before. 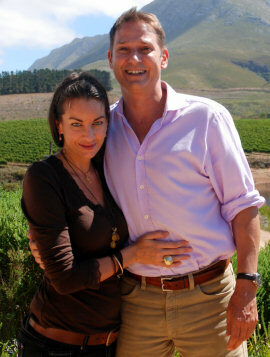 All Elgin fruit as 2009 was a year of fires in Hemel-en-Aarde, so fruit not available. The wine spends five months in tank post-fermentation, with lees stirring. Very mineral, with no herbaceous aromas, but a citrus peel and gentle gooseberry and melon fruit. On the palate a lovely lime and lemon quality, a gentle ruby grapefruit character and plenty of tight, steely acidity. Intelligent stuff in a reserved style. 90/100. £11 Around 3,600 cases made. Twelve months in barriques, 40% new. A Syrah based blend (I got that much out of Kevin Grant). Quite a delicate, spice and pepper nose. There’s a tightness about the fruit too, with some nice black berries. On the palate a real firmess at the core of this, a beautiful edge of cherry and plum skins, with nicely spicy notes and a firm core of something gravelly. Very fine. 92/100. Around 2000 cases. 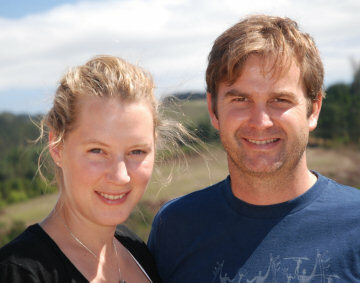 Eksteen and his business partners started HermanusPietersfontein in 2005 with a small cellar, but 2006 was the first vintage made in their winery on the outskirts of the town of Hermanus. The farm is remote – at the end of a 20 kilometre gravel road – so a visitor centre and winery that was more accessible has grown to become a foodie tourist attraction in its own right. Apart from a tasting room, there’s a food and wine market in the winery courtyard every Saturday where people come and sit under the umbrellas eating breakfasts, oysters, cheeses, homemade preserves and tasting local wines. “We can have 1000 people through on a Saturday,” says Eksteen. Hermanus Pieters was a Dutch teacher in the area, who started a sheep farm and discovered a spring where he would camp. In 1855 the town of was named Hermanus Pieter Fontein after him, and later shortened to Hermanus, so Eksteen’s label is a hommage to the town’s original name. They have 64 hectares under vine. “I am a Sauvignon Blanc Freak,” says Eksteen, and that is the focus of the farm, with Rhône blends and some Bordeaux blends too. The company now has two farms, one owned and one leased, with different soils that suit the different varieties. 71% Sauvignon Blanc with 20% Semillon (five months in new and 2nd fill French oak), 9% Nouvelle. Fascinating nose, with big, grassy, punchy passionfruit and elderflower character and some creamy, lemon rind qualities with Granny Smith notes. The palate has delightful weight on the palate, with lovely citrus freshness, but also a waxy, mouth-coating weight. There’s a lovely zestiness to this, the grassy cut still there adding a vitality and new-mown freshness. 91/100. From next year the whole blend will go back into a foudre to marry together. A blend of fruit, mostly from Elgin and Walker Bay, dominated by 90% Shiraz with 8% Mourvedre and 2% Viognier. 20 months in new and second fill French oak. Lovely nose, tinged with coffee and spicy clove and herbal, thyme notes. Black cherries and a plummy quality, and plenty of oak here, but quite a balanced, cool style. The palate has very nice ripe cherry flavours, the oak very spicy and tannins very grippy, even a touch dry. It is not quite leathery, but has a fairly forceful, spicy finish where the quality and depth of fruit just about holds its own. Could be improved by a touch less oak I feel. 91/100. A blend of around half Cabernet Sauvignon with smaller amounts of Merlot, Cabernet Franc and Malbec, and a small percentage of Petit Verdot. 24 months in new and second fill French oak. Unusual nose in some ways, with a slightly resinous, almost olive-like note quality that is fascinating but unexpected quality of oak I think. That quality comes through on the palate. Nice palate, with lots of smooth chocolaty fruit and lovely tannins. Long and delicious. 91/100. Gordon’s father Dave Johnson and mother Felicity (née ‘Newton’) entered the wine business in the 70s, and whilst the family lavishes love and attention on Newton Johnson, they are significant players in the Cape, also part-owners of the giant “First Cape” brand. Newton Johnson is a very different proposition to the supermarket level First Cape however, importing barrels directly from a small coopers in Burgundy and practising high-density planting on their 18 hectare vineyard. A mix of soils across two sites – one north-facing and one south-facing – includes variable concentrations and depths of decomposed granite, quartz, and clay. Pinot Noir and Chardonnay remain the bedrocks of the small portfolio, but now Sauvignon Blanc, Syrah and Mourvèdre too. Bush-vine Grenache has recently been planted on very stony soils “It looks just like Châteauneuf-du-Pape,” says Gordon. First bottling of estate fruit (D for Domaine). Quite a heavy, complex nose, with some vegetal but figgy notes. Nicely apply fruit with honey. Creamy and nicely buttery and cabbagey (in a Burgundian way) but not at all blowsy, with lovely acids and length. 90/100. From a single estate vineyard. Light, soft, oxidative colour. Beautifully soft, fudge and chocolaty nose with plenty of spice and a little gamy edge. Soft pulpy fruit adds to a mellow picture. The palate has a delicious harmony, with a soft red fruit and spice palate, good tannins and juicy cherry acidity the lengthens and freshens the finish. Delicate and a very beautiful. 93/100. A blend of the three Hemel-en-Aarde appellations . Much more delicate, more subdued nose., but then pepper and spice is more apparent, and on the palate there’s no lack of fruit but a stylish, refined wine with lovely smoothness to the tannins. 91/100. Though Creation say their story is “as old as the hills,” in fact this is a new, boutique operation on the Hemel-en-Aarde Ridge that is for now off the beaten track along a dirt road that rises through increasingly cooler temperatures. Vineyards were planted here in 2003, with virus-free stock on virgin land. Winemaker JC Martin (right) says he has planted “A lot of Sauvignon Blanc and Viognier, a bit less Chardonnay,” though there is also some Semillon and, for red wines, Pinot Noir, Merlot, Cabernet Sauvignon, Petit Verdot, Syrah and Grenache. Picked fully ripe, but still has minerality and acidity. Lovely fragrance here, with floral notes and just a little hint of truffly earthiness over the spicy red fruit. The palate has a definite freshness and cut, with plenty of red fruit acidity and the spice coming through, giving this a firm finish, touched with liquorice and gravelly minerality. 90/100. 14.5% alcohol, 12 months in barrels, 25% new. About 80% Syrah and 20% Grenache. Picked fully ripe, but still had to remove some acidity. Chocolaty and ripe, with a rounded cherryish and blackcurrant fruit and some charry oak notes. A big wine, huge and chocolaty, with the big espresso and thick, glossy black fruit New World character. Huge, but balanced and delicious of its style. 89/100. A little touch of earthiness and a herbal background note, but nicely ashy and graphite qualities. The palate has a juiciness and nice supple roundness, maybe the sweet fruit butting against the tannin and oak a little, but should gain a little more integration and harmony in time. 89/100. 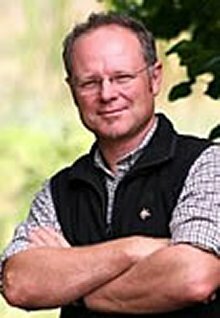 He believes strongly that Pinot will only perform in perfect conditions, and that yields need to be very low. “It’s a white wine variety that only produces reds under special conditions,” he half-jokes, indicating the delicate handling and respect he feels the variety deserves. From a contracted vineyard Peter has made the wine from since 1992. Kaimansgaat. Vineyards at 700 metres above sea level “like a Swiss mountain” from un-irrigated vines. A touch of apple, melon and almost creamy almond fruit. Nice little background of tangerine. On the palate the lemony precision of the fruit is lovely, with quite a full, textural palate and fine balance. Tight and very youthful, and again will benefit from a few months in barrel just to soften the tannins. 91/100. A mix of blond barrels with no toast, through to medium toast. Beautifully Burgundian nose, with some fragrant notes to the nutty melon and apple fruit and a little mineral character. The palate has a lovely mouth-feel too, with a nicely sour lemon and apple quality. Very nice balanced wine with great length. 91/100. Very young, with quite a closed nose, but nice fragrance coming through with similar characters to the 2008. The Palate too has a lovely orangy burst of intense fruit and a lovely nuttiness in the finish. This has great promise and perhaps for me an even more shimmering quality that could see it nudge ahead in time. 91-92/100. 30% new wood. 10 parcels of Pinot, several different clones. Beautifully delicate colour. Anthony says is in a dumb period and will re-emerge with gamy characters. Nice cherry and savoury briar notes, but yes, quite subtle. The palate is lovely, with really nice fruit that is fleshy but not soft, with a real backbone of tannin and good acidity. 92/100. Challenging vintage. Very low yields and declassified a lot of wine. More chocolate and brighter, more plump cherry and plum fruit. The oak seems more upfront, with char and toast. The fruit is very juicy and deliciously constrained by firm tannins and black plum tartness to the acidity. 92/100. Fairly buoyant spice and cherry fruit, with graphite hints and plenty of clove like spice. The palate has a really firm edge at present. The char of the tight-grained oak, the liquoricy grip of the tannins and tight acidity adding a very firm, juicy character to this young wine. Promising. 91-92/100. Niels started by buying all of his fruit, but now uses around 25% of grapes from his own farm, “but we will hopefully have 100% estate wine from 2012,” he tells me. He farms “close to organic,” in this dry region and is excited by his programme of ploughing the fynbos he uses as a cover crop back into the soil. “It will definitely affect the aromas and flavours in the wine,” he says with conviction. “There’s a particularly curry bush fynbos that is undeniably in the vineyard, and apparent in the wine.” He uses around 25% new oak, and then a range of older barrels, mostly French with some Hungarian and a few American barrels. “I’m obsessed with Shiraz. 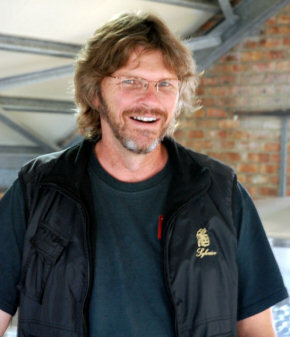 When I was younger I had no taste for beer, but I loved wine and grew up with favourite Shirazes, like those from Hartenberg.” He worked for seven years with Beaumont, whilst also travelling all over the Cape to find the best site for his Shiraz dream, finally settling on Walker Bay where he was the first to plant the variety. Very floral nose, hugely aromatic. Lots of lift and spice, bold red fruits. The palate has lots of creamy, soft fruit, but that spice, pepper and those firmer cherryish flavours really come through. It has layers of complexity, with cedar and spice, and really nice tannins adding a smooth, creamy but firm edge. Acidity is fresh, and the finish is long and balanced. 93/100. £19.99 – £24.99. Slightly more foursquare, with a more obvious layering of spice and Sandalwood, and more peppery and meaty notes coming through here. The palate has a more density than the 2005, at least at this stage, and there’s a sense of bigger, sweeter, more voluptuous wine here. Plenty of dry extract, but the sweetness is lovely. Bigger and quite different in many ways to the 2005, but a another lovely wine. 93/100.